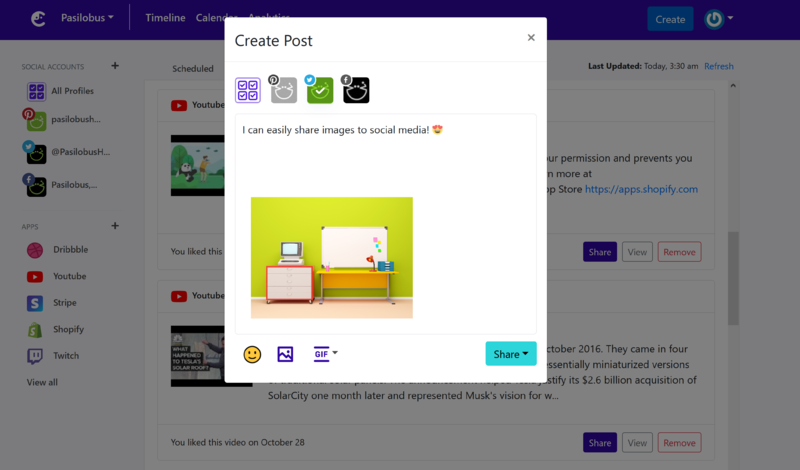 You can enhance your posts by attaching an image, gif or video. Use the image uploader in the post editor. The maximum file size you can upload is 15 MB. Comity may resize or compress your files if the image attributes or the ratio exceeds the limitations enforced by the social network. Facebook: We resize images not to exceed 3000 pixels height. Instagram: We resize images not to exceed 1920 pixels width. Twitter: We resize images not to exceed 1024 pixels width. Linkedin: We resize images not to exceed 4746 pixels width. Pinterest: We resize images not to exceed 600 pixels width. Use images that are at least 1080 pixels in width for best display on high-resolution devices. At the minimum, you should use images that are 600 pixels in width. We recommend using 1:1 image in your posts. For best performance please try to upload compressed image files as much as possible. You can upload GIFs to all social accounts however social networks enforce some limitations for GIF display. Video attachment is a beta feature, to get access please contact support.